My first performance posting regarding VMware Server’s love of large fast drives (/2007/06/performance-note-for-vms-they-love-fast.html) was sufficient, but not detailed enough for some readers. So I thought I’d give you guys a bit more technical information on measuring performance while using VMware Server. I recently created a rather large vm. 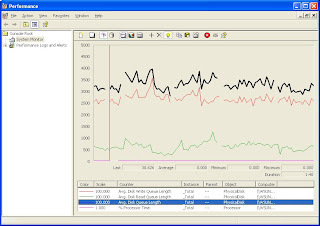 It is a 45GB XP Professional guest OS built using VMware Converter 3.0.0 build 39557 and runs under the latest VMware Server version 1.0.3 build-44356. VMware Server is running on my desktop, XP Professional running on a Dell Precision 670 workstation with dual 3Ghz Xeons and 3.2GB RAM. Average Disk Queue Length is a sum of the number of read and write requests (Read/Write Queue Lengths) queued for the selected disk. Obviously, Average Disk Read Queue Length is the number of read requests queued for the selected disk and Average Disk Write Queue Length is the number of read requests queued. Such things as disk speed, disk cache size, i/o bus speed and RAID configuration (if any) affect disk throughput, which is the amount of read and write requests that the disk system can handle at any one time. 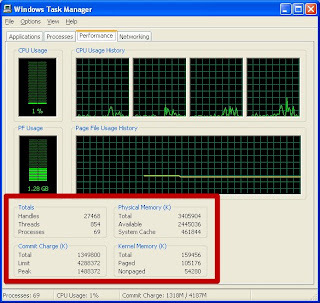 I saw that my system slowed down considerably while using my big XP virtual machine, so I started Performance Monitor and selected the key indicators shown above plus “% Processor Time”, a measure of the amount of CPU used. After I started up my XP vm, it booted up to the logon prompt and I logged in. Immediately, I noticed my system slowed down to a crawl. If I tried to open any applications, those applications would take five minutes to start. So where’s the problem? However, Total Physical Memory does not exceed Total Commit Charge (shown in the above graphic). This would indicate insufficient system RAM. From these stats, it looks like my system is not memory bound. Disk Queuing Through the Roof! 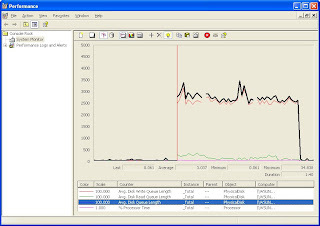 In the Performance Monitor graph shown above, the black line is Avg. Disk Queue Length. You’ll notice that if you add the values of Avg. 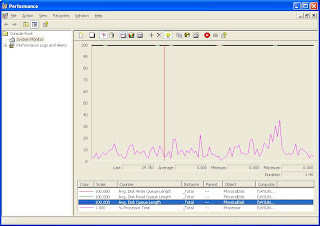 Disk Write Queue Length and Avg. Disk Queue Read Length together at any one point in time, that the sum of those values is equal to Avg. Disk Queue Length. In a system performing optimally, there should be little disk queuing happening. 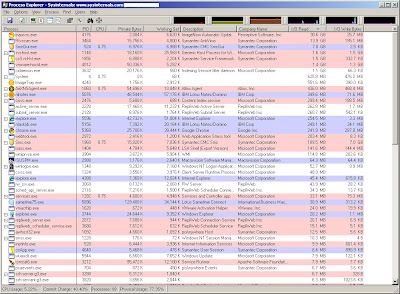 According to the help menus in Performance Monitor, the recommended values of Avg. Disk Queue Length should be the number of spindles plus 2. In this case, I have a stripe set (RAID0) of two drives. There are two spindles corresponding to the spindle in each drive of the stripe set, so the optimum Avg Disk Queue Length of my system should be less that four. 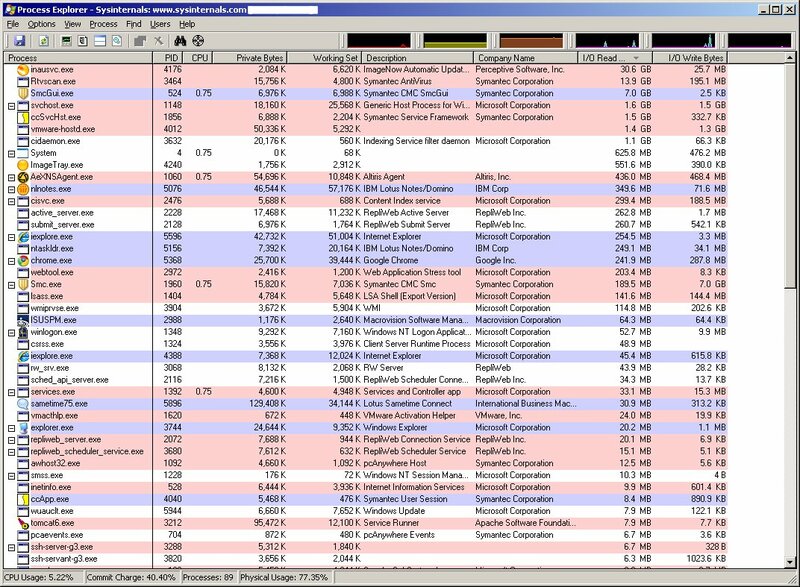 You can see in the above graphic that the high disk queue condition stops after I’ve logged into my XP vm and the guest OS fully loads. For the 45GB XP guest OS running on my dual proc Dell Precision workstation, this took a full twenty minutes! Wow. That is a LOT of disk queuing. Again, CPU and memory stayed fairly constant during this experiment. 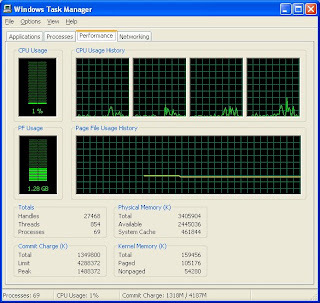 CPU was roughly 30% and there was a little less than 2GB of RAM available during the process. Perhaps the VMware engineers can explain why the VM took so long to free up my disk resources, but I suspect that it is simply the fact that the virtual machine is so big (45GB) and that VMware Server cannot handle a vm of that size efficiently. I’d really need a server class machine with super fast disk i/o to handle the intense read/write activity. Perhaps you have an interesting VMware performance story? If so, drop me a line at cacasododom@gmail.com or just comment below.